In this second of the three posts series on analyst’s take on the Next Leap Forward for Digital India, we argue for the need to expand the focus and redefine the metrics that measure Digital India initiatives. One of the flagship government initiatives, the Direct Benefits Transfer (DBT) mission, had resulted into a total savings of Rs 90,000 crore till May 2018, mainly due to the removal of fake beneficiaries. Similarly, there are many other digital initiatives that have resulted in either efficient distribution of public funds or effective processes saving time to deliver. No doubt these are no mean achievements, given the scale of our economy. Yet, the assessment of digital initiatives must evolve, with time, beyond the basic operational metrics of cost and time savings (Figure 1). The debate is not new. The business side has been dealing with this phenomenon for quite some time now. In a cut throat global market, where there is a rapid replication of any competitive advantage, business enterprises cannot get complacent, they are continuously exploring ways to redefine the metrics justifying IT and digital investments. 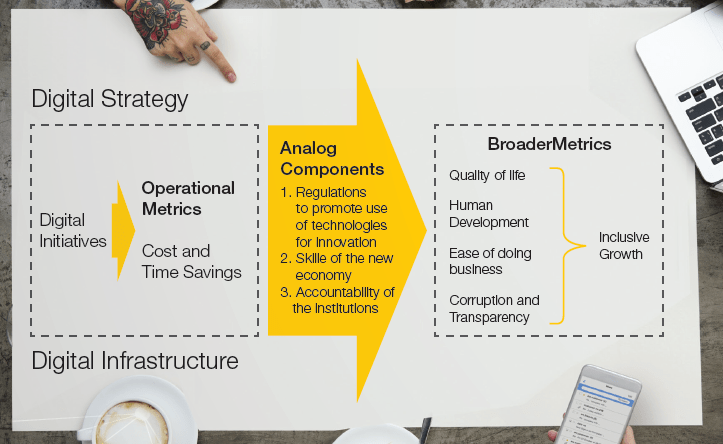 Governments also need to redefine the metrics with time as the cost and time savings may not capture the true impact of digital for two reasons. One, they may not remove the deeper problems of governance and two, they may not be sustainable over time as automation gains are generally high in the beginning, and usually moderate later. 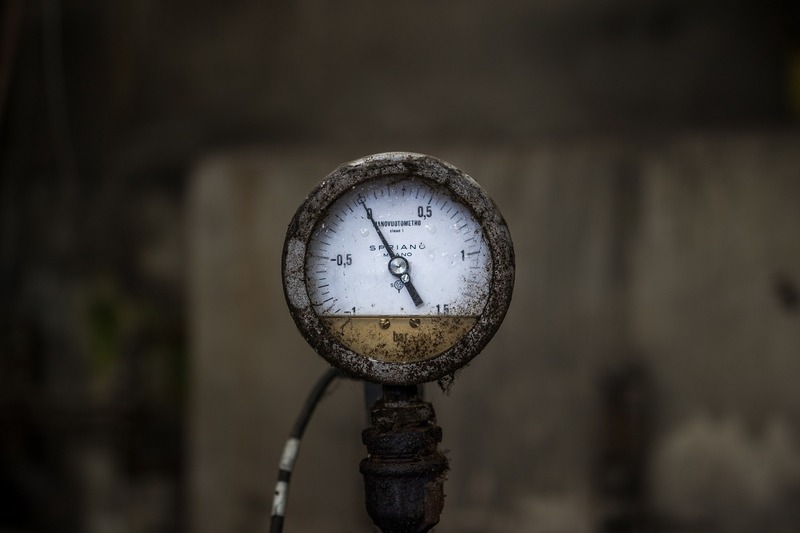 The real questions are: what are the right metrics? And how could these reflect the essence of inclusive and sustainable growth, improved quality of governance, and responsive service delivery? The impact assessment of Digital India must gradually move from basic operational parameters to more broad and strategic aspects like quality of human development, quality of life, ease of doing business, rate of poverty, corruption index, and degree of transparency and openness. All these put together may be termed as ‘inclusive growth’. India’s standing on most of these parameters has not been very good, though recent improvements in some has been an encouraging sign (e.g., on ease of doing business, we have moved up from 142nd rank to 100th rank in a period of three years). However, there is more to this game than just digital and its broader impacts. The relationship between digital initiatives and high-level strategic parameters is not a simple one, as the former does not automatically result into the latter. There is something more that needs to work for this relationship to be positively co-related. A 2015 World Bank report titled ‘Digital Dividends’ clearly stated that to get the most out of the digital revolution, countries also needed to focus on what it called the “analog complements”— by strengthening regulations that ensure competition among businesses, by adapting workers’ skills to the demands of the new economy, and by ensuring that institutions are accountable. Digital technologies can, in turn, augment and strengthen these ‘complements,’ thus accelerating the pace of development. For example, a common data pool of the performance of various government driven initiatives, covering every sub process involved, would be a concrete step toward enhancing the accountability of the institutions. The relationship can be mutually reinforcing, yet the ‘complements’ also need to be strengthened through policy reforms, process transformation, and a new leadership vision. An equal emphasis may be required in terms of new policies to define new standards of accountability and process transformation to support those standards. Many of the institutions require the overhaul to become more citizen-centric and accountable for service delivery. One can imagine the quality of crime investigations by the police, delay in settling court cases, inferior quality of food grains being distributed, inability of the health services to provide timely services, low quality of primary and secondary education in government institutions, apathy of urban civic amenities, and so on. Often the citizens’ experiences of running from pillar to post to get a basic service is still not very good. These issues represent the readiness of our institutions to deliver. Digital can make a significant difference, yet the overhauls in many cases are also a must. Without that, digital dividends may remain restricted to operational parameters, which may not be sustainable over time. Digital India is not and cannot be simply about digital technologies. It must be about how a new paradigm of governance emerges that is truly citizen-centric, simple to access and use, transparent, and efficient. Toward that end, the government has to change. The process has surely started, but a lot remains to be done. In the next post, we shall present seven aspects around which the next leap must happen.